and a freehand version of drunkard's path blocks. So, this time at least, I have been practising what I preached. Good for you for doing what you where talking about. I usually do not buy collections of fabric, but the Moda fabric which is the upper left piece in the 9 patch caught my eye. I ended up buying a half yard of 17 of the 19 fabrics the quilt shop had of this collection - Nocturne. 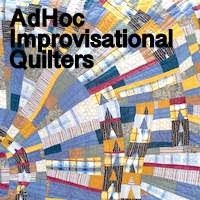 I improv pieced a drunkard path flannel quilt last year and recently finished it. I like how you did your block with the pieced pie part. I added another layer of complexity to the block. Isn't it funny how sometimes we need the obvious pointing out to us! Sometimes we're just doing what we're preaching without even realising it, it's become second nature :) I really love the way this quilt is panning out and can't wait to see more :) I'll be back at the weekend to link up something I'm working on, in the mean time I'm off to check out some of the other wonderful pieces I spy above!